Before Vin Diesel seemingly cornered the market on fast cars and Family, another film mixed these two concepts to good effect, in fact some may even argue better than the earlier Fast and Furious movies. Nicholas Cage would steal cars, get the girl and save his own family in an often overlooked but very cool heist movie. Gone in Sixty Seconds shares a lot of it’s DNA with the classic heist movies of old. It has impossible odds, a team of characters working together in their own invaluable ways, a dastardly villain and stakes which are high enough for an audience to care about the thieves. This is the heist movie brought crashing into the 21st century. Made just before it’s Fast and Furious cousins, Gone in Sixty Seconds tapped into a mysterious, cool and unknown world – car boosting. Not theft for the sake of it but theft for the selling of cars and high-end cars at that. This isn’t a film of dodgy motors but one of Porsches, Ferraris and Ford GTs. It makes for a very cool film and adds a great mystique to an otherwise grimy underworld. To it’s credit, it does have a cool cast to help sell this unobtainable lifestyle. You can never be quite sure which type of Nicholas Cage you will get but here he is fun and cool rather than over-excited and wacky. He is clearly enjoying himself and taking a great cast along for the ride. 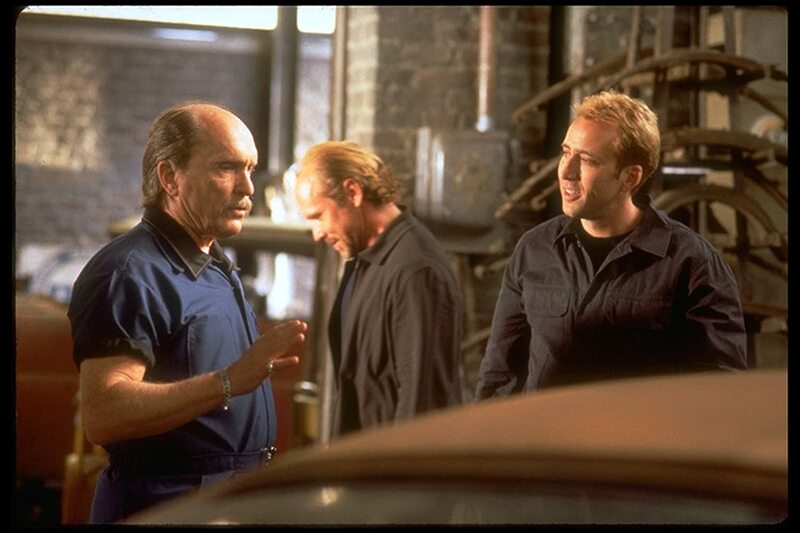 In a game of “before they were famous,” Gone in Sixty Seconds would give you points for Angelina Jolie, Scott Caan and Timothy Olyphant while also bringing in older hands like Robert Duvall and Will Patton along for the ride. That is one of the charms of the heist movie: the crew. Gone in Sixty Seconds doesn’t disappoint, with everyone from Caan’s hacker through to ex-footballing legend Vinnie Jones as a silent muscle. Along with the stealing cars is a great humour, with the cast showing chemistry which gives the impression they have been doing this for years. That is one of the biggest strengths of the movie: it builds a history in a short run-time. There is a legacy to Nicholas Cage’s Memphis Raines and a backstory which is explored well without any heavy exposition. His shared past with many of the characters is often unfolded in a few sentences or single actions and it is credit to effective story-telling that a whole “family” can be built around such a small thread. It is a shame that this sort of care doesn’t extend to the villain. Christopher Eccleston plays a great bad guy and although he falls into the “European villain” category, he has enough menace and presence to add real stake to the movie. It is such a shame that he essentially bookends the film and is forgotten for the most part as he is a character that should be as developed as the heroes he is facing. This is a movie about stealing cars though and on this front, it doesn’t disappoint. There are chases aplenty, clever twists in the boosting car formula and enough peril in one night of stealing 50 cars to maintain any audience’s interest. Along the lines of shared backstory and developed history, the last car stolen has a story of it’s own with a great, city-wide, destruction-filled chase to help tell it. 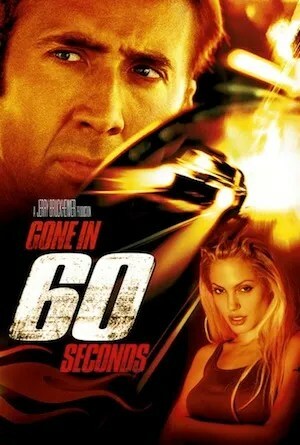 Overall, Gone in Sixty Seconds was being Fast and Furious before Vin Diesel raced his first car. This is a film with a great cast, an exciting story and some well-developed characters that can give a lesson in exposition-less development. It is a shame this courtesy doesn’t extend to the villain but when it is this exciting, all can be forgiven. Good remake. I liked it better than the original.